7/29/06 - I wrote another Spuffy twist of an episode - Phases - called Symbiosis. You can find it here. PG13 for once, but the ending may leave you begging for more. 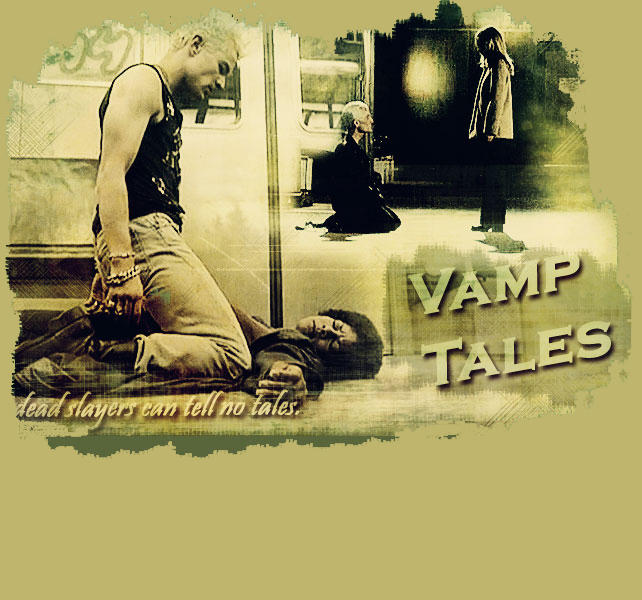 Vampires and Slayers and Werewolves - oh my! to Thrill, and also Best Author. Thank you, whoever nominated. I'm truly grateful. Pimping here - go nominate your favourite sites/stories/authors. It really does make an author's day." 7/26/06 - Two new fics for you - well, one's a ficlet really. It's Just Lust is a short ficlet I wrote for a friend's birthday - Buffy's pov, fun and smutty. You can read it here. Lady Luck is a second story I wrote for the 'Snarkathon' on Live Journal. The first chapter is here. Hope you enjoy, more very soon. 7/1/06 - Hello all. Well, it's been a while and I can only apologise. I come bearing new fic! In the Heat of the Night was written for a Snarkathon, the fic's criteria at the end. Spike and Buffy snarl and posture but eventually give in to the inevitable. NC17, of course. You can read it here. Hope you enjoy. I know you're expecting some chapters of already started stories - they are coming; I'm working on them right now. Take care. 6/2/06 - Spuffy Twist ahead - I love taking an episode and twisting it so that Spike and Buffy get some action, and this is my version of Reptile Boy. Go here to read. Hope you enjoy! 5/20/06 - Quick update : I wrote a short ficlet - very schmoopy and sweet but with a side of snark - for an LJ friend's birthday. Go here to read - suitable for all would you believe!? And License to Thrill has been nominated in this round of the Spuffy Awards. Thank you kind nominator! Voting is open now and there are oodles of great stories up for your delight and delectation. Enjoy! 5/10/06- Come Back to Me - next chapter is here. You thought I'd forgotten, didn't you? Don't worry, I am finishing this story, and the threads are all coming together. Although, some of the characters seem to be coming apart....did that grab you? Hope you like. I'm also thrilled to tell you that I've received a nomination at the Fang Fetish Awards for Best Author. Any nominations are wonderful, and get the writing muscles pumping - but Best Author? I'm just stunned. Thank you, whoever you are. You've no idea what that means to me. 5/2/06 - Spike Blond is in peril - or he will be if Buffy catches him revisiting old haunts; but she isn't likely to at the moment as she has her hands full with other things. Another chapter of Octobuffy here. Hmm, now what else - chapters of Come Back to Me and more Octobuffy are with my beta, Lou, so there shouldn't be long to wait and I'm penning a Spuffy Twist of Reptile Boy that's due to be posted on the 27 May. Looks like I should get cracking! Hope you like the update. Take care. 4/24/06 - Chapter 2 of Octobuffy is here. Buffy finds herself in a tight spot and Spike Blond is not a happy vampire. In other news, I'm delighted that Birthday Girl Buffy won some awards at the Breathless Awards site. And Fly Me to the Moon won Best PWP *snicker* at the Lost In Spike Awards. Go HERE to see the pretties. I'm also thrilled that the sequel to Fly Me, Let Me Play Amongst the Stars, is nominated at the Fang Fetish Awards for the next round. All in all, I'm very happy! Thank you so much whoever nominated. 4/2/06 - New fic for you here. I signed up to write Spuffy twists of Season 1 BtVS and "Demon Dreams" is the result. It's a twist of the episode Nightmares to feed my Spuffy obsession. PG13 for once! And due to popular demand already, I'm plotting a sequel to flesh out their relationship. Hope you enjoy. I just wanted to publicly thank whoever nominated me at the Loves Last Glimpse Awards. Got a lovely e-mail to say that Come Back to Me has been nominated for Best WIP, Angst, Plot and Villain (Angel) and Octobuffy for Best Comedy/Fluff and PWP. Thank you so much, you've made my day whoever you are!